Opening launch: Friday 5 October 6.30- 8.30pm. 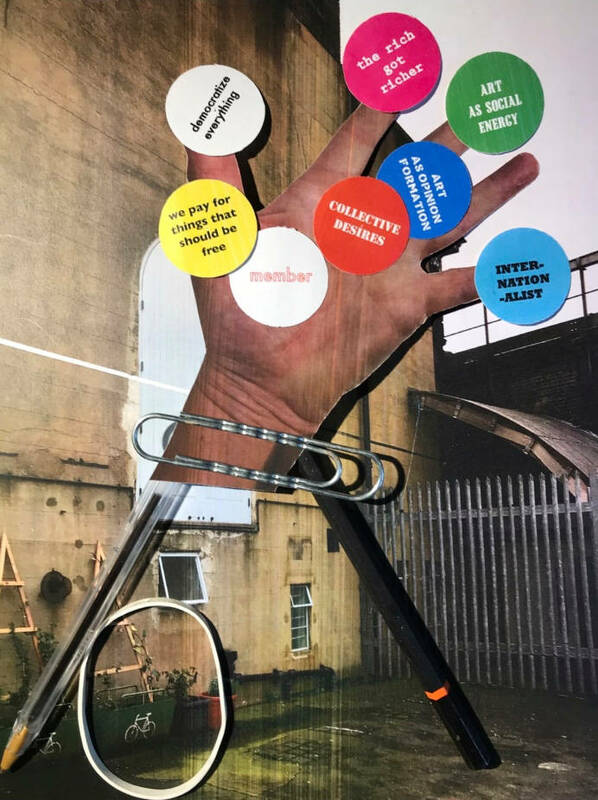 On being together; memberships, collectives and unions, is a project aimed at developing new artworks dedicated to the concept of ‘membership’ to be sited in the outdoor spaces of Beaconsfield Gallery Vauxhall (BGV), London. The project invited ‘members’ to join in with the realisation of a social sculpture: its design, build and the programming of its activities around collectives, unions, groups and clubs. The Partisan Social Club was initiated by Andy Hewitt and Mel Jordan and evolved with the members who signed up to undertake a series of workshops on the production and publishing of slogans at Beaconsfield in September 2018. An introductory talk ‘on members’ by Jonathan White, Professor of Politics at London School of Economics, opened up the subject to participants who went on to experiment with the construction of social structures and the embodiment of texts in the public realm across the public spaces of Beaconsfield. Mel Jordan, Khaver Idrees, Louise King, Tiantian Liu, Liz Murray, Annabelle Nguyen, Joanna Osieglewska, Tina Rousou, Iza Sasaran, Alexia Soteriou, Sven Storm, Allan Struthers, Yukako Tanaka, Toby Tobais, Ewelina Trejta, Simon Tyszko, Kai Wang, Wei Zhou. This practical, creative workshop led by artist and musician Timothy Cape will use slogans created during the Partisan Social Club’s residency, and turn them into song form. Together we will choose the slogan, adapt it, develop it, find it’s rhythm, and turn it into song. The process looks at how a slogan can be brought to life and embodied through emphasis, rhythm and melody. No musical experience required. As part of the Partisan Social Club residency at Beaconsfield Gallery Vauxhall, artist-musician Toby Tobias-Kidd will lead a group workshop in a practical act of subversion. With the aid of musicians and each other, workshop participants will inquire through doing how the format of a pop song might be used to discuss and develop opinions and critique. No musical experience is necessary to partake.